The average Nigerian can count on having electricity only a few hours a day, if at all. But for 11 communities, there’s now one place they know the lights will always be on: their local health clinic. And at 172 schools around the state of Lagos, students now not only have access to computers, they can even charge headlamps to use for studying back in their darkened homes in the evenings. That’s thanks to high-tech, self-contained solar systems put together with technology from Schneider Electric and funded by the U.K. Department for International Development (DFID) and the state government of Lagos. The Lagos Solar project uses batteries that are charged by solar panels, along with intelligent inverters connected to Microsoft Azure IoT technology that not only convert the battery power into usable electricity but also allow for remote monitoring and maintenance. It’s a vast improvement over the unreliable and polluting diesel generators most Nigerians are stuck with. The program is expanding to 270 schools and will benefit 190,000 students and 4.7 million patients by 2020, creating more than 3,000 jobs, according to the DFID. A nurse in Nigeria now has reliable light to see her patient’s blood pressure readings. The African country’s power woes are well known. The infrastructure in the country of 179 million only has the ability to produce enough energy to power a city about the size of Halifax, Canada, home to fewer than half a million. The Africa Progress Report 2015 found that 65 percent of Nigeria’s primary schools lack access to electricity. And the country has the world’s highest concentration of diesel generators, which are not only unreliable but generate pollution, both from operating them and from transporting fuel to the villages. Sunshine, however, is a clean power that Nigerians can rely on. Schneider’s standalone solar systems are able to take advantage of that resource by not only harnessing the energy but storing it for use when the sun goes down. 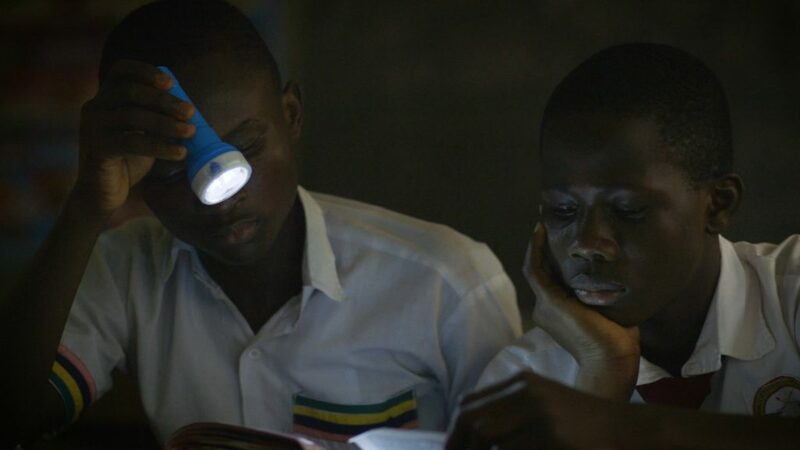 Nigerian students can charge flashlights at school to study at home in the evenings. The project has had a huge impact on the quality of education for Nigerian pupils, “increasing their zeal towards learning” and making them more aware of alternative energy as well, says Damilola Makindipe, the head of solar projects for the Lagos State Electricity Board. The clinics have been able to provide more and better healthcare to everyone in the chosen communities while reducing the expenses and the air and noise pollution involved with generators, she says. For remote sites like these that aren’t connected to a public electrical grid, there has to be a way to store solar energy so it can be used after sunset. That’s where the batteries come in. They’re each the size of a typical car battery, and they line the walls of the system’s container and get charged by the solar panels during daylight hours. Schneider’s suitcase-sized inverters then convert the batteries’ 48-volt energy into the typical Nigerian appliance’s 230 volts, running through power lines into the school or clinic to power everything from lights to laptops. Without this system, many of the country’s hospitals have had to rely on generators for power. 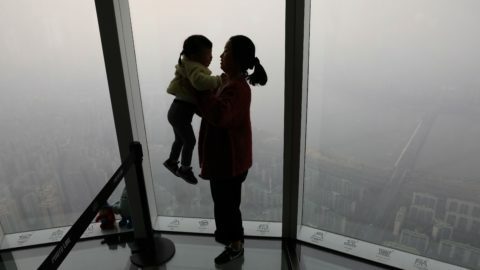 If the fuel runs out or there’s another problem, they can be without electricity for 12 hours or more, which can be a grave lapse for severely ill patients needing urgent medical treatment. “Reliability is absolutely critical, and that’s why this solution is the most successful for remote applications like this program in Africa,” Datin says. Nigerian students now have reliable electricity for classroom computers. It’s the ability to infuse the inverters with cloud-based intelligence that’s revolutionizing the industry and making the whole project possible, he says. The systems can be used anywhere, but the connectivity aspect with Schneider’s Conext Insight is particularly important for the remote schools and clinics in Nigeria. It’s difficult and expensive to send trained technicians to such rural sites to fix problems that pop up. But with the cloud-based remote monitoring in the Azure IoT Suite, a technician can be anywhere in the world and still download a necessary update to the firmware or notice that a certain level is getting low and be able to notify someone on-site to dust off the solar panel, for example. Without that element, clinics might not know anything was wrong until the power went out. The system also collects data via Cortana Intelligence Suite from every unit analysis, identifying trends so technicians can address issues before they lead to outages. For example, previous history might show that a certain drop in electricity generated by a solar panel may indicate that a panel needs to be cleaned or a battery checked within 12 hours or it could fail. The analytics allow remote monitors to help proactively ward off those types of problems. Inverters inside a Schneider Electric solar power system container. The project is helping France-based Schneider, already a global powerhouse with revenues of $30 billion and 170,000 employees serving customers in more than 100 countries, expand its reach to work with consumers as well as the traditional commercial customers that make up the bulk of its business, Datin says. “Solar energy is not only renewable and carbon neutral, but with this system you can use it exactly where you need it, so you don’t incur a loss on producing, generating and transmitting that power,” Datin says. “That’s a big advantage. And economically, you can afford to produce electricity in remote places that would be very difficult to power if you had to run power lines to the locations or if you had to get diesel there for generators. “It’s changing the world,” he says.